Your blog isn’t a special star that shines brighter than the others. It’s another blog in a world where 160 million other blogs exist. You need to change that and that can only happen when you learn how to write powerful blog posts. Most of the people that come to your site will only do so once. They will come, scan the post, and leave. That’s why bounce rates are never 0%. If you can’t leave some type of positive impact with your blog post then don’t be surprised if your audience goes elsewhere to find that impact. Welcome mats, pop ups, and other tricks aren’t going to save you here. When they say content is king they truly mean it. 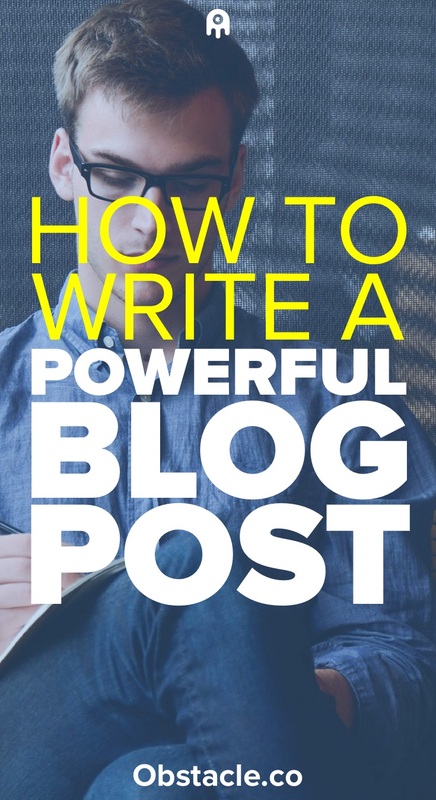 Here are some ways to write a powerful blog post. Okay, this first point has nothing to do with writing at all and has everything to do with the reading experience. If a person can’t take the time to read your blog post in a nice environment then they will quickly leave. Nobody wants to be bombarded with distractions while trying to read the magical blog post that is going to solve all of their problems. If your blog’s theme doesn’t provide a nice and clean experience then why should people stick around to read your post? I go back and forth on this blog between having a sidebar and not having one. A single column design provides the most optimal reading experience but the sidebar gives me an opportunity to share what this place is about. The best thing you can do is experiment and see which solution works best. There is a fine balance between trying to get someone to sign up for your mailing list and completely bombarding them with things that they don’t care about. What can you do to improve your design? Some sidebars are overloaded with information that doesn’t help the reader out at all. Simplify your navigation and menus. Your blog isn’t Amazon. Break up paragraphs and add bullet points and other separators that make your posts easier to read. I’m going with the assumption that your blog was created to teach people. It could be about blogging, gardening, or parenting, it doesn’t matter. People visit your blog to learn. If that is the case then a great post needs to be actionable. What I mean is that when someone reads your post can they immediately do something that will help them out when they are done? In this post, you will be able to go through your blog to see if your blog posts include the tips mentioned here. A blog post on a gardening blog that just shows pictures of tulips isn’t as helpful as one that shows you how to grow those tulips. Admittedly, I have a tough time always making sure my posts are actionable. Sometimes I just want to talk about theory or rant a little bit and that’s okay. Not every post you write has to be a grand slam. Why start a blog if you can’t enjoy writing on it? Graphics help to draw people into your blog post. They also do a great job of breaking up that wall of text. If you think about it, most people like to quickly scan blog posts before reading. They usually do this because they want to get a feel for the post to see if it is worth reading. A giant wall of text lets them know that they would have to focus really hard to get any value out of the post and sadly, most people don’t want to do that. Images help to break things up and make the post a bit more approachable. They also do a great job of helping with SEO. It’s also important to remember the impact of graphics on social media. When someone shares your posts on Facebook it is usually accompanied by an image. Pinterest is one of the largest sites on the Internet and it is solely driven by images. If you don’t have a pinnable image in your post then you are missing out on a potentially large chunk of traffic. If you aren’t a graphic design that’s okay. There are some great services out there, like PicMonkey and Canva, that will help you put some nice images together. Most blogs that I come across are dull and have no personality. I hate blogs like this. I didn’t sit through boring lectures in college only to sit down and read boring blog posts. I’m not saying that you need to be entertaining, but you don’t your reader to feel like there is some human writing the post. But you already know these things. What helped me find my voice and rhythm was to start writing like I was talking to myself. I pretended that nobody else was going to read my blog posts. It as like writing in a diary. When you write in a diary or journal you don’t worry about sounding professional, you just write and it sounds like you. People go to your blog to find a solution to your problem but you want to give them another objective as well. You want them to build a connection with you. They can’t do that with a robot. Some people take this tip the wrong way. They think that showing authority only means that you have the knowledge to talk about a certain topic. There are a number of bloggers that I work with that want to write about a certain topic but because they don’t think they are experts at it yet they stop themselves from doing it. If I am going to start a gardening blog I don’t need to be an expert at gardening, I just have to be someone that is going through the journey of learning about gardening. People want to be able to relate to you in some way. They can either relate to you because they see you’ve taken the journey that they are now on or they can relate to you because they see that you both are on the journey together. That is showing your authority. Not getting enough social media shares or comments on your posts? Are you asking for them? You don’t get what you don’t ask for so be sure that you include some type of call-to-action at the end of your blog post. This is something that you’ll have to get used to in all of your blogging actions. You need to learn how to ask for stuff. It’s the only way you can get things to happen. Every day we are bombarded with millions of messages that somehow we have to tune out. If someone decides to take a chance and read your blog post then you need to ensure that you make it useful. This could be by providing them with an actionable tip or putting a smile on their face. Every time you write a post ask yourself if the person reading it is going to get something out of it. Writing powerful blog post is an art form that takes practice. You won’t nail it the first time, but you also won’t improve if you don’t work on it. One of the best things about blogging is that nothing is permanent. 6 months from now you’ll look at the post that you wrote today and shake your head because you can’t believe it was you that wrote it. You can fix it up. You can improve it. You can make it more of a representation of the person you are today. All of the knowledge you’ve gained can now be applied to the posts you’ve written in the past. You don’t have to write new posts to make up for what you wrote in the past. Just go back in time and fix things up. You don’t get what you don’t ask for so I’m asking you to take a second to share How to Write a Powerful Blog Post That Your Audience Loves with your audience. They respect great content.